The Centrestage Mall is one of the oldest malls in Noida and I have visited it even before I started blogging 12 years ago! Today though, the mall’s main attraction is Wave Cinema. In fact, if it wasn’t for Wave, I doubt many people would actually be visiting it. I know I haven’t in past so many years and I only went there this weekend to watch Incredibles 2. With its big auditoriums spanning pretty much all the floors, Wave has numerous movies running simultaneously and it was the only place where I could find good seats when I started looking for them at 4 pm on Sunday. Since I booked the ticket using Bookmyshow, I had to shell out Rs. 270 per ticket and Rs. 59 as internet handling fee. Considering this is the weekend ticket price, it isn’t too bad. Audi 1 on the third floor is huge, almost as big as traditional movie halls. However, it is beginning to show its age. The seats while ok comfort wise, wouldn’t stay down if you weren’t sitting on them and would automatically fold up. The 3D glasses had smudges and scratches on them. Good thing was, the staff was handing out tissue papers, so that we could clean them. Even though it is a big auditorium, screen size was pretty much the same as most multiplexes. So if you’re sitting towards the back, the screen is going to look small! From the J Row, where we were sitting and this photo was taken, it seemed fine (there were 6 rows behind us in classic category). Screen quality was fine and 3D experience was fabulous, to say the least. I am not quite sure if the Incredibles 2 gave us such a spectacular 3D experience or if it was the Wave, but either way, I loved it and would count it as one of the best if not the best 3D movie experience I have had. Sound Quality too was quite good and didn’t leave any room for complaints. They allow water bottles inside the theater, so it is a major plus. There is also a bag counter on the third floor for those carrying laptops. Though they seem to allow bags as well since I saw someone carrying a backpack after I deposited my bag at the counter and went inside. Men’s washroom was clean and well maintained. 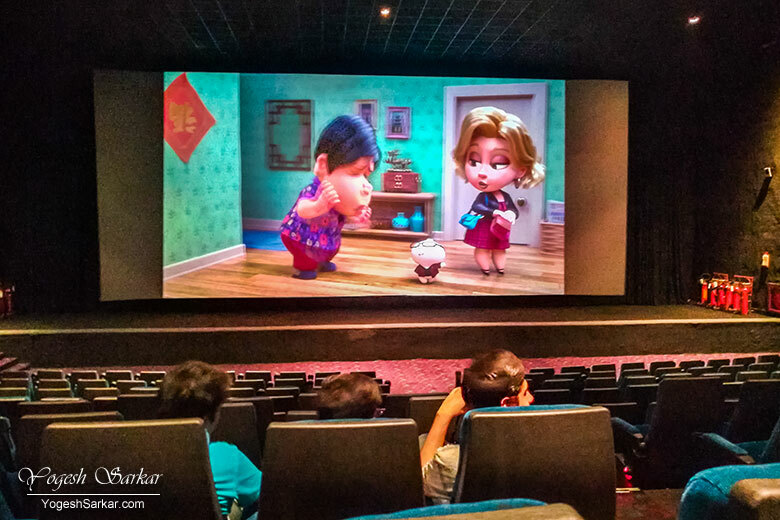 Even though Wave might not look as grand or attractive as PVR Logix and some of the other multiplexes, it has good seats available even during the weekend and that too when it is located in a good and convenient place. Plus the staff is courteous and it was difficult to find any faults with it, except maybe the small screen in the seemingly large hall. Overall, I quite enjoyed my movie experience at Wave and wouldn’t think twice about going there again.